The double meaning- punished for your beliefs and standing by those beliefs- is at the core of “Conviction,” a dynamic one person theatre piece at New Jewish Theatre. Adapted by the Israeli playwright and actor, Ami Dayan, his performance is as compelling as the story he relates. After a man is caught trying to steal a dossier on a Spanish priest from the 15th century Spanish Inquisition from the Franco-controlled National Archives in 1962, the current “inquisitor” tries to find out what is so important about this file. 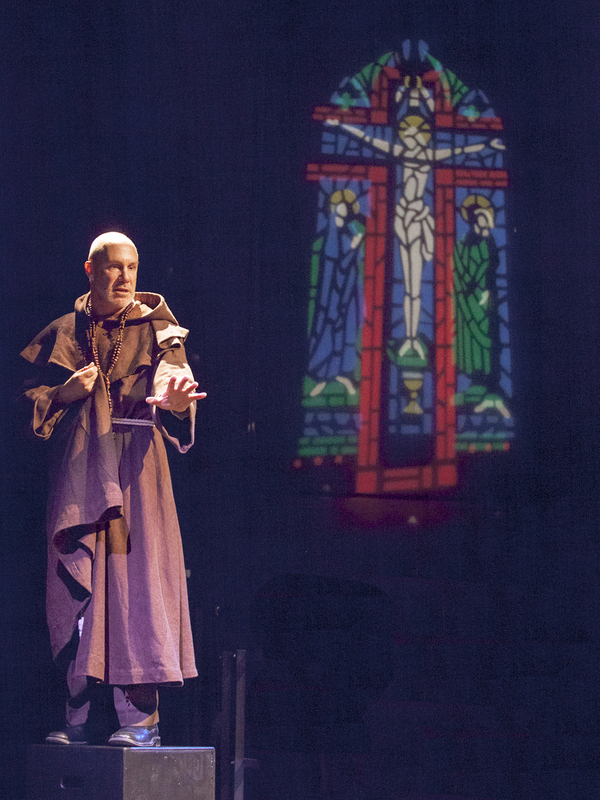 So we see the true life story unfold on stage of Andres Gonzalez who is really a “converso,” a Jew who has “converted” to Christianity during the Inquisition to protect his life. Although a common practice in the 15th century in Spain, the government still stalked and tried to “out” the Jews who were secretly still practicing their faith. Actually becoming a priest, Andres eventually falls in love with a Jewish woman, Isabel, who leads him back to his faith which begins a complicated journey of deception and inner turmoil for him. Confiding in a mentor, the story of Andres is taken down and remains in the Spanish National Archives where the story starts in the 1960’s. Leading to an unexpected conclusion, “Conviction” is a powerful 75-minute one-act that becomes a tour de force for Ami Dayan who has performed this piece in many venues and languages throughout the world. 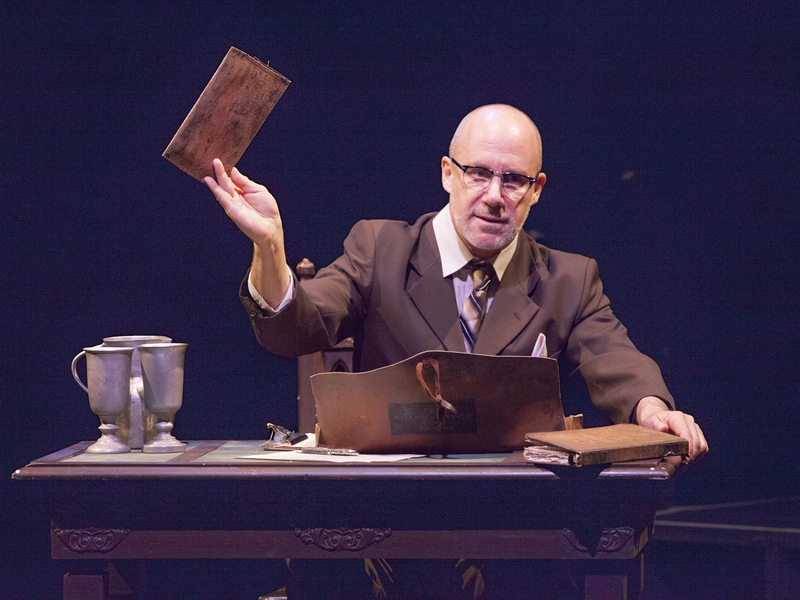 Although normally staged on a more conventional proscenium stage, director Joe Gfaller has reworked it in the round for New Jewish. It is possibly even more dramatic in this form as Mr. Dayan is able to move to designated areas that more effectively impact the story and the myriad of characters involved. Nathan Schroeder’s lighting design and the costumes of Michele Friedman Siler only enhance this complex yet easy to follow story. And Mr. Dayan’s ability to subtly portray many characters without going “over the top” is marvelous to watch. “Conviction” is a most welcome addition to the New Jewish season and an unexpected surprise. Not only does it cover a moment in history that is not familiar to most, it is powerful drama as well. It’s a short run- only through April 14th- so make plans to see this one as soon as you can. This entry was posted on April 6, 2013 at 9:43 pm04 and is filed under Uncategorized. You can follow any responses to this entry through the RSS 2.0 feed. You can leave a response, or trackback from your own site.